This year, with the new blog officially released, I wanted to participate on the side of giving away. Most giving participants are poets themselves, giving away at least one of their own books and at least one book from another poet whose work they enjoy. Seeing as I do not have my own book (yet), I am giving away two books from poets I love. The first book, the one on the left, is the complete poems of Joyce Kilmer. Kilmer was famous for the poem that begins “I think that I shall never see / A poem lovely as a tree”, which I honestly never cared for after having it shoved at me in school. But when I finally sat down with a volume of the rest of his work, I learned that I absolutely love his voice. One of my favorite poems of his is “Prayer of a Soldier in France”. His work is simple, eloquent, and often to-the-point. 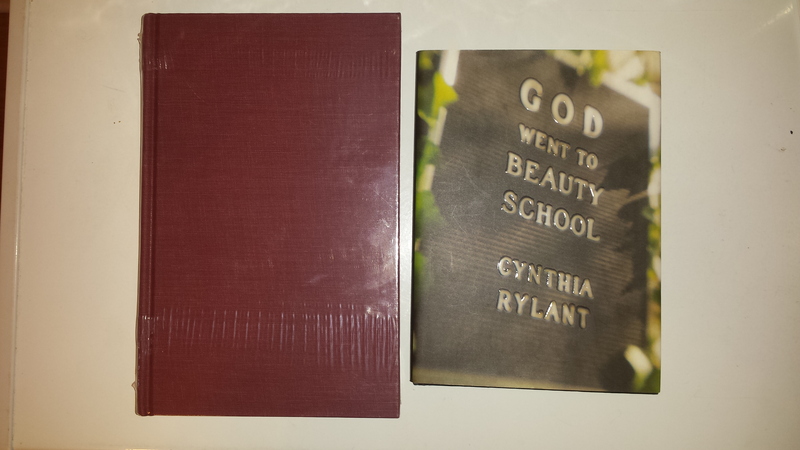 The second book, “God Went to Beauty School”, I picked up at a used book sale a little while back. The title kept drawing me in, and eventually I could overlook it no further and brought it home with me. This might be one of my favorite books of all time, and if you think you aren’t much of a poetry fan, this book might turn you. Cynthia Rylant’s book is a beautiful example of spirituality in daily life without the heavy burden of official ‘religion’. This book makes me laugh, smile, and cry. I have one of the poems framed on my desk at work. I want to give this book away to everyone I know. Maybe this month it will be you! If you want to make this more interactive, in addition to your name and email for the giveaway, leave me a question or two. It can be about me or my writing. If enough people do this, I’ll pick some of my favorites and do a fun ‘about me’ post in May! Get creative! 2. What is your greatest indulgence? It did! Thank you. My blog is just set for me to approve first-time comments from new people. Once first approval is given you shouldn’t have any further delays in future commenting. =) I’ve just had lots of trouble with spam over the years on other blogs I have kept up with and this seems the easiest way for me to weed out the real people from the spammers and computers! Thanks for the opportunity to enter this wonderful giveaway! These poetry books sound awesome. Please enter me in the giveaway. I’d be happy with either book. Questions? Okay, I’ll play along. I’ll go at it from a Barbara Walters angle to make it more fun. 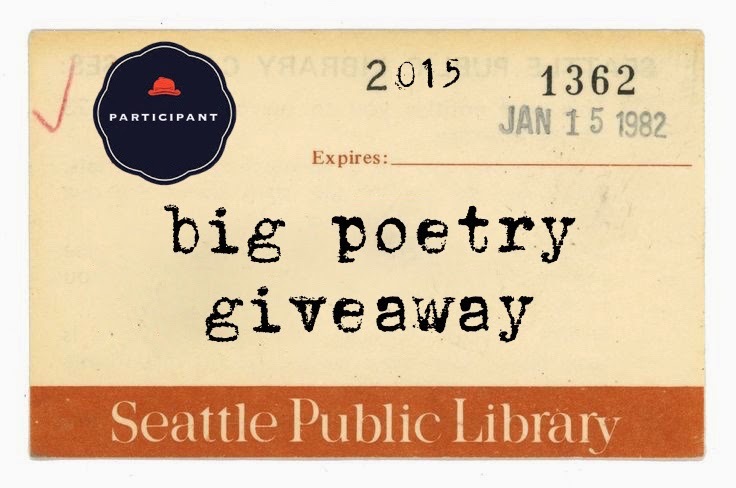 question #1: what is the first poem you remember reading and enjoying? question #2: If you were a poem, what poem would you be? question #3: Do your feel your poetry has evolved over time or do you have a style that you’ve stayed true to? And are the topics of your poems more based on personal experience or fantasy or a mix of both? God Went to Beauty School sounds fantastic. P.S. Here’s a question for you. What’s your favorite type of music? My question: How often does the first line of a poem you write stay the first line when it’s finished? How does the process of getting the first line down work for you? – In what way is writing poetry a spiritual endeavor for you? – Please describe your relationship with your muse. HI Ann Hart annmaryhart@hotmail.com Thanks for participating in the give away! Do you read novels? Who are some of your favorite novelists? Do you prefer poetically written novels, or do you prefer more straight-forward, plot-driven prose? Or does it depend on your mood? I love 2nd hand book so 3rd must be even better. I feel I should at least tell you I’ve heard you rave about these books (particularly the second) so much that I am going to have to locate a copy and read for myself at some point, even though I also feel I should not enter myself in your giveaway. I mostly commented, though, because I want to ask you for your about me post – a) What is your favourite ‘studio’ space in which to write? and b) Do you have a favourite form(s) to write or read poetry (do you have a favourite to read and a different to write?) or is it mutable depending on mood/subject?